Meet the requirements of your facility with these precast concrete park benches. Made of precast solid concrete, you can mix and match the frame with a rugged stone look and the backrest/seat with a smooth comfort texture. Frames are available in a standard Exposed Aggregate Finish or customize the look with a Ground Glass Concrete Finish. Backrest and seat come in your choice of a Weatherstone or Smooth Stained concrete finish and are available in a variety of colors. The backrest and seat require assembly. 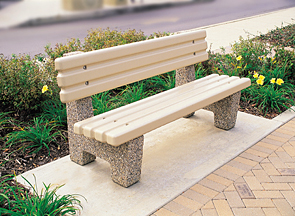 Precast Concrete Park Benches must be placed on a flat stable surface that will not shift or settle such as concrete.